Chan Wai Fat is a self-taught musician and composer from Hong Kong. He’s been active since the late 80s, playing in a number of noise-rock bands before later focusing on totally free improvisation. He is the founder of CIMG (Collective Improvisational Music Group), and has performed with John Zorn, Yamatsuka Eye, Fred Frith, and many others. The center-piece of the album is the “12 Pieces for Prepared Acoustic Guitar” (T5-T16) which feature beautifully sparse and delicate guitar strumming and tinkering, as well as a few more “accidental” sounds. 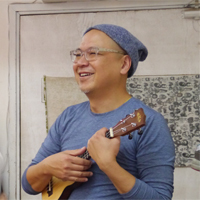 Wai Fat evokes similar peaceful moods with his pentatonic plucking on the Hawaiian steel guitar (T2) as well as on the octavilla (T20). There are some nice drones here as well — “Miles Away” (T3) is probably my favorite on the whole album. The final (listed) track “Songbird: Variation on a Theme by Kenny G” (T21) features the most energetic — often frenetic — noodling (again on the octavilla) with no discernible sign of Kenny G.
1) The first track ends with the sounds of a skipping CD player. Do not panic, the CD is fine. I actually really recommend this one. 2) The final track (T22) is not listed in the liner notes, and is almost completely SILENT, except for the sound of the tape recorder, very distant birds, and an occasional footstep.